Vietnam’s agricultural business climate, priorities to develop agriculture as well as incentives for agricultural investments were introduced at a conference held in Osaka, Japan on April 27. The event, jointly held by the Consulate General of Vietnam in Osaka, the Japan International Cooperation Agency (JICA), the Japan External Trade Organisation (JETRO) and the Osaka Chamber of Commerce and Industry (OCCI), aims to attract Japanese investments and technical transfer to Vietnam’s agriculture. The conference drew the attention of more than 100 Japanese enterprises in the Kansai region, mostly operating in agriculture production, breed development, distribution, transport and banking. They showed interest in the Vietnamese market while saying that they have plans to land agricultural investments in Vietnam. Suitable natural conditions, an abundant workforce as well as a large domestic market give momentum for agriculture development in Vietnam, Vietnamese Consul General Tran Duc Binh highlighted in his opening remark. He added that regional and international links and free trade agreements such as the Trans Pacific Partnership (TPP) and the Regional Comprehensive Economic Partnership (RCEP) pacts have opened opportunities for agricultural cooperation between Vietnam and Japan. Meanwhile, representatives from the Japanese Ministry of Agriculture, Forestry and Fisheries, JETRO, JICA and enterprises spoke highly of Vietnam’s agricultural potential, affirming to closely operate with Vietnam to carry out the contents of the Vietnam-Japan Medium and Long-Term Vision on Agricultural Cooperation. They stressed that Vietnam needs to focus on technological and technical application in producing, processing, preservation and distribution as well as building trade mark, which helps increase productivity and enhance the competitiveness of Vietnamese products in regional and international markets. Hailing the Vietnamese Government and local authorities’ efforts to improve the business climate, they hoped that the Vietnamese Government would continue to complete its legal document system, improve administrative procedures and promote infrastructure construction in order to create more favourable conditions for Japanese enterprises. Chairman of the Ho Chi Minh City People’s Committee Nguyen Thanh Phong has asked for specific measures to raise the city’s competitiveness indices as building a healthy and transparent investment environment is most important. Speaking at a conference on the city’s situation in April and the first four months of 2016 on April 28, Phong noted that the city’s competitiveness indices have reduced gradually in recent years. Its Provincial Governance and Public Administration Performance Index (PAPI) is ranked 47th out of 63 cities and provinces, down 29 places compared with 2011. Meanwhile, its Provincial Competitiveness Index (PCI) also dropped from 4th place in 2014 to 6 th place in 2015. Among the PCI, the transparency from 4th to 17th place, he added. To improve these indices, the municipal Department of Planning and Investment proposed several measures. However, Phong said that these measures remain unspecific and have yet to get straight to the point. According to the municipal People’s Committee, the city will focus on administrative reform to create favourable conditions for businesses, organisations and individuals. Viet Nam's total exports saw a year-on-year increase of 6 per cent in the first four months of this year to US$52.87 billion, according to the General Statistics Office (GSO). Of this, the domestic economic enterprises saw a year-on-year surge of 2.9 per cent in export value to $15.11 billion in the first four months, while the foreign direct invested firms had a year-on-year growth of 7.3 per cent in export value to $37.76 billion. GSO experts said this was a result of the positive growth of national exports, in the face of a drop in crude oil exports by 52 per cent to $678 million in the first four months, due to the strong reduction in world oil prices. Meanwhile, 30 key export products saw a strong increase in export value in the first four months. These included vegetable and fruit with a growth of 43.3 per cent to $741 million; telephone and its components, up 23.8 per cent to $474 million; gemstone and precious metals, up by 22.8 per cent to $260 million; and machine and equipment, up by 15.8 per cent $2.86 billion, in addition to petrol products, up by 12.6 per cent to $259 million; and handbags, hats and umbrellas, up by 10.8 per cent to $1.36 billion. However, some other key export products faced low growth or even reduction in export value such as seafood (up by 3.8 per cent), bamboo and rattan (up by 2.6 per cent), footwear (up by 4.8 per cent), and tea (down by 14.2 per cent), in addition to cassava (down by 23.5 per cent). The GSO also reported in the first four months of this year, the national import value reduced 1.2 per cent year-on-year to $51.4 billion, including $20.7 billion from domestic enterprises and $30.7 billion from FDI enterprises. Therefore, the nation gained a trade surplus of $1.46 billion in the first four months of this year. The products which witnessed a big reduction in import value included animal feed (down by 17.7 per cent), petrol (33.3 per cent), and completely built-up automobiles (23.5 per cent). The office said value of imports from China fell strongly to $14.7 billion in the first four months, reducing trade deficit with China by 12.7 per cent year-on-year to $8.9 billion. The Embassy of Vietnam has held a forum in Genova, Italy to promote investment in Vietnam. It was attended by many local companies which were interested in doing business in the country. Paolo Odone, Chairman of Genova Chamber of Commerce, said the 80,000- member chamber wants to boost trade ties with foreign markets, especially Vietnam. They look forwards for basic information about Vietnam’s market from Vietnamese representative agencies in Italy. Ambassador to Italy Cao Chinh Thien appreciated Italian businesses’ proposals and underscored that the two sides should pay more attention to boosting investment cooperation on par with fine bilateral relations. Through Vietnam, Italian businesses will be able to expand investment to other ASEAN member countries, Thien noted. Mauro Cotogno, President of Italy-Vietnam Friendship Association branch in Liguria, said the double taxation avoidance agreement between Italy and Vietnam and the EU-Vietnam Free Trade Agreement (EVFTA) will bring about investment opportunities for Italian businesses. Reality has shown that many Italian firms are successfully running business in Vietnam after only one market research, Mr Cotogno said. Trade counsellor Bui Vuong Anh answered in detail all questions of Italian businesses on Vietnam’s tax policies, intellectual property rights and human resources. Paolo Odone’s initiative on a Vietnam study tour of Italian businesses was highly appreciated. A group of businesses in northern and north-western Italy will visit Vietnam to seek investment opportunities late this year. Bangkok Airways said on April 27 that it would launch Bangkok-Danang service on May 25 with four weekly flights in the initial time. The flights will be conducted on Mondays, Wednesdays, Fridays and Saturdays, taking off in Bangkok at 11:00 a.m. and landing in Danang at 12:35 p.m.. The departure and arrival schedules of the return flights will be 1:35 p.m. in the central coast city of Vietnam and at 3:15 p.m. in the capital of Thailand. The carrier will use Airbus A319 aircraft configured with 138 seats for the new route. Varong Israsena Na Ayudhya, vice president for sales at Bangkok Airways, said at a news briefing in HCMC on April 27 that the airline had decided to operate direct flights to Danang after having carefully surveyed the market. Danang has a lot of tourist attractions. With return fares from US$213, Bangkok Airways expects to attract many passengers of the two countries. Varong said Bangkok Airways is in talks with Vietnam Airlines for a codeshare agreement on transporting passengers to domestic airports of Vietnam and Thailand. Bangkok Airways looks to expand to other airports in Vietnam. Deputy Prime Minister Vuong Dinh Hue asked all ministries to learn more about the stock market. The deputy PM said he wanted to make the stock market an important channel for capital mobilisation so it could share the burden with the banking sector. At a meeting with the State Securities Commission (SSC) and leaders of the Ministry of Finance, the Ministry of Planning and Investment, the State Bank and the Office of Government in Ha Noi on April 27, Hue said Viet Nam needed to mobilise its financial resources, rather than rely solely on development budgets, which were decreasing. He said all ministries should be fully aware of the potential of the stock market so they could contribute to building a complete legal system and institution for stock market development. The market could become an important channel for raising capital for development. Hue said the local market has witnessed significant development, contributing to increasing the liquidity and improving the transparency of the financial markets. According to the SSC, the market index grew by 65 per cent compared with 2011. The local market is showing signs of becoming a channel for capital mobilisation, having already contributed some 23 per cent to total social investment. The SSC said there were 686 companies listed on the stock market and 256 companies that traded on the unofficial market of UpCom, a two-fold increase compared with 2011. Until the end of 2015, the market capitalisation of shares was almost 35 per cent of the local GDP, 1.5 times higher than in 2011 and 145 times higher than in 2005. The Government bond market reported an average growth rate of 31 per cent, also becoming an important channel for capital mobilisation for the Government. So far, the G-bond market comprises 59 per cent of total GDP, accounting for over half of banking system loans. Hue asked the SSC to find solutions to attract more foreign investors to the market. He said the SSC should work with other sectors and ministries to open venture capital funds, develop the corporate bond market and run the derivatives market. He also asked SSC to reform its administrative procedures and improve the quality of staff and facilities to create favorable conditions for businesses and investors. Hue said the government would continue to promote the equitisation of state enterprises in both quantity and quality to create more resources to develop the market. In response, SSC Chairman Vu Bang said the commission would continue to focus on enhancing and restructuring the stock market. He said the SSC had recommended the Government remove obstacles to attract foreign capital by enabling foreign banks to open branches in Viet Nam. The SSC also asked the Government to allow more foreign ownership in the local market, reduce administrative procedures in portfolio investment, increase publicity and encourage transparency in the flow of capital to develop the market. The National Citizen Bank (NCB) is targeting a net profit of VNĐ171.6 billion (US$7.65 million) this year. As of December 31, 2015, the bank's total assets reached VNĐ48 trillion, seven per cent higher than the year's target and 31 per cent higher than 2014. NCB's revenue from service and guarantee fees in 2015 increased 129 per cent compared with 2014, net profit in 2015 touched VNĐ111 billion, 88 per cent higher than the previous year, and non- performing loan ratio was controlled at 2.15 per cent. The bank is targeting total assets worth VNĐ61.12 trillion in 2016. The Ministry of Transport has approved Vietnam Post Corporation (VNPost) and Viettel Post Joint Stock Corporation to receive applications from individuals who want renew their driver’s licenses and deliver them to customers’ door. VNPost said it has offered the service at its 30 post offices and will make it available at all VNPost-run post offices nationwide next month. Viettel Post has been in business since April 24, when the company cooperated with the Transport Department of Quang Ngai Province to launch the service for residents on the remote island of Ly Son. Now, it takes the islanders much less time to arrive at a Viettel Post office on Ly Son to submit their applications for renewing their driver’s licenses, instead of two days previously. Ha Hoang Viet Phuong, deputy director of the department, said the agency will cooperate with Viettel Post to offer the service in mountainous areas and other places in the central province in the coming time. Nguyen Dac Luan, deputy general director of Viettel Post, said the company will make the service available in 15 out of 63 provinces and cities next month. Ngo Hai Phan, head of the Administrative Procedure Management Department under the Ministry of Justice, said at a conference on Tuesday that more than VND1.6 trillion (US$72 million) was saved from administrative documents sent by and returned to people via mail last year. At the conference held in Hanoi to collect comments on a draft decision of the Prime Minister on receipt and return of administrative documents, Phan said at least 600,000 transactions relating to administrative procedures are done a day. Traditionally, individuals and businesses have to go to offices of government agencies to submit documents and come back to get the results. However, post offices have been allowed to handle the job for them so they can save a lot of money and time. VNPost said last year alone, it handled nine million dossiers relating to ID cards, driver’s licenses, passports and social insurance, and helped customers save at least VND1.602 trillion. Customers would have paid almost VND1.84 trillion instead of VND234 billion if they had submitted documents and got results at offices of government agencies. Wages for senior managers in a number of sectors have risen by 53% this year compared to last year as demand outpaces supply, according to the latest report of JobStreet.com. The report provides a list of the top 10 sectors in terms of wagepaymentin 2016. Of them, enterprises in the real estate and health sectors offer higher salaries than those in other sectors. In particular, a senior manager in the real estate sector can earnVND129.5 million (US$5,808) a month, well above VND66 million (US$2,960) offered to a manager in the marketing sector. Salaries for senior managers in the information technology sector come third with an average of VND63 million (US$2,825) per month while that in the finance-banking sector is ranked tenth with an average of over VND33 million (US$1,480). Data of JobStreet.com showed the average wage in some sectors in Vietnam is still lower than those in other ASEAN nations,including Singapore, Malaysia and the Philippines. The average monthly wage in Vietnamis 1.5 times lowerthan that in the Philippines, three times lower than in Malaysia, and nearly six times lower in Singapore. For instance, a fresh graduate can earn US$250-387 a month in Vietnam but the salary is US$1,337-1,879 per month in Singapore. A representative of JobStreet.com said the comparison is based on monthly wages offered in certain sectors and position levels. Wages vary in different countries depending on jobs and employment requirements. JobStreet.com is active in Malaysia, the Philippines, Singapore, Indonesia, and Vietnam. The southern city of Tây Ninh is the last point in the Cửu Long (Mekong River) Delta region but from the perspective of ASEAN connectivity the city is the starting point connecting Việt Nam with the Southeast Asia region, said Phan Chánh Dưỡng, lecturer of the Fulbright Economic Teaching Program. The lecturer was speaking at the training course on ASEAN connectivity in Tây Ninh City on Wednesday which aimed to support local governments incorporate the ASEAN Economic Community (AEC) and ASEAN Connectivity into their works and adjusting their strategies to strengthen local governance. According to Dưỡng’s analysis, Tây Ninh has the resources to become an ideal place for regional connectivity. The province has a stable climate and is not as affected by climate change as other provinces in the Mekong Delta. The city is also located on the Trans-Asia Highway and is close to HCM City. If all the advantages are utilised then Tây Ninh could link the economic hub HCM City with ASEAN markets, specifically Cambodia, Laos and Thailand, the expert said. Professor Alvin Ang from Ateneo de Manila University said that Tây Ninh should become a secondary city after HCM City rather than rival such a big city and use regional connectivity to develop its economy. The Trans-Asia Highway contributes to ensuring the free flow of goods and services, a primary condition for regional economic integration, the Pilipino scholar said. The problem is how to make Tây Ninh a place that goods and services must go through when ASEAN markets are connected, he said. Dr. Trương Minh Huy Vũ, director of the Centre for International Studies (SCIS), added that Tây Ninh can be a bridge for East-West connectivity that is for the whole country. Vice-chairman of Tây Ninh People’s Committee Nguyễn Thanh Ngọc said that the government had highlighted the importance of regional connectivity for years but the actions has not lived up to expectations. Dưỡng argued that localities only looked out for themselves and neglected partners so no one had motivation for co-operation. To boost regional connectivity, Dưỡng said, each country should take partners into consideration to ensure mutual benefits. Among the three pillars of ASEAN, beside the ASEAN Political-Security Community and ASEAN Socio-Cultural Community, AEC could be seen as the most influential and significant pillar as it allows more connections and improve trade among member countries, said Prof. Ang. The two-day seminar, sponsored by Konrad-Adenauer-Stiftung Vietnam, attracted about 70 researchers and Tây Ninh municipal and district officials. Some nine million administrative records were registered and returned through postal services last year, saving more than VNĐ1.6 trillion (US$71 million), an official said. “The expenses to directly register and return the administrative records at offices amounted to more than VNĐ1.8 trillion ($80 million). However, people only had to pay some VNĐ230 billion (nearly $10 million) when they used postal services,” Việt Nam Post’s vice-general director, Chu Thị Lan Hương, said at a conference this week. She said that registering and returning administrative records through postal services not only created advantages for citizens and curbed corruption but also contributed to the development of public services. “A minimum of 600,000 administrative documents are exchanged each day. If they are registered and returned directly to offices, it requires individuals and organisations to spend a lot of effort, time and money,” Ngô Hải Phan, director of the department of administrative control under the Ministry of Justice (MoJ), told online newspaper infonet.vn. MoJ worked with the Ministry of Communication and Information and Việt Nam Post to build the draft on registering and returning administrative records through postal services. India has released its report on anti-dumping investigation into Plain Medium Density Fibreboard (MDF) imported from Vietnam and Indonesia. The Vietnam Competition Authority (VCA) under the Ministry of Industry and Trade said on April 28 the Indian Directorate General of Anti-Dumping and Allied Duties (DGAD) concluded that prices of MDF exported to India were lower than normal, causing significant damage to the Indian industry. As the result, DGAD decided to impose dumping margins of 0-15% and damage margins of 10-40% on Vietnamese businesses who answered its questionnaires and dumping margins of 30-40% and damage margins of 35-45% on those who did not. DGAD will base on that conclusion to announce its final decision. Vietnamese businesses had the only chance to send their petitions to DGAD prior to May 2, 2016 before DGAD issues its final decision. Shareholders of PAN Group JSC (PAN), which is active in the agricultural sector, have approved a plan to raise foreign ownership in the listed firm on the Hochiminh Stock Exchange to up to 100%. At the general meeting on Tuesday, shareholders authorized PAN’s board to draw up a road map and work with authorities to carry out the plan. PAN chairman Nguyen Duy Hung said the firm wants to raise the foreign ownership limit (FOL) to 100% but this would take time as PAN is now in control of the two biggest seed companies in Vietnam. However, under Vietnam’s commitments to the Trans-Pacific Partnership (TPP) trade pact, the nation would not restrict foreign investment in the agricultural sector. Hung said PAN will send the FOL hike plan to the State Securities Commission and the Ministry of Planning and Investment after the Reunification Day (April 30) holiday. He said the FOL hike is expected by many investors and that foreign investors are finding big domestic companies in the agricultural and food sectors to make investments. There are few producers of clean food in Vietnam, he said. PAN is setting up its own distribution system for rice, seafood, cashew nut, confectionery and fish sauce. Hung said PAN eyes good businesses. The company wants to become an agricultural corporation rather than trading shares as Vietnam’s agricultural sector can compete with foreign rivals in the future. PAN is now a major shareholder of National Seed Company (NSC) and Southern Seed Company (SSC) they own and trade exclusive seedlings. The enterprise holds a 99.9% stake in PAN Food Company (PAN Food), 62.5% in Ben Tre Aquaproduct Import and Export JSC (ABT), 76.7% in Long An Food Processing Export JSC (LAF) and 42.2% in Bibica Corporation (BBC). PAN had total chartered capital of over VND1 trillion by end-2015. Its revenue stood at VND2.65 trillion and consolidated after-tax profit at VND315 billion, up 2-fold each from a year earlier. Of PAN’s revenue, NSC contributed VND1.24 trillion, LAF VND534 billion, ABT VND474 billion and the remainder from BBC, PAN Services and PAN Food. This year, the enterprise aims for consolidated net revenue of VND3.33 trillion and consolidated net profit of VND415 billion, and pay a dividend in cash at 10%. As many as 10,954 enterprises were formed in April with total registered capital of 62.2 trillion VND (over 2.7 billion USD), according to the General Statistics Office (GSO). The number of newly-established business increased 19.2 percent year-on-year, while registered capital jumped 21.3 percent against the same period last year. In the first four months of this year, 34,721 new enterprises were established with total capital of 248.2 trillion VND (nearly 10.8 billion USD), a year-on-year rises of 22.9 percent and 52.8 percent, respectively. During the reviewed period, each new company had an average investment of 7.1 billion VND (308,000 USD), up 24.2 percent over the same period last year. The new firms are expected to employ 427,200 people. A total of 801.5 trillion VND (34.8 billion USD) was added to the country’s economy. According to the GSO, 25,135 enterprises stopped operation from January to April, meanwhile, 11,331 enterprises resumed operations. The European Union has issued food safety alerts to four Vietnamese seafood exporters, whose shipments to several European countries have been found to contain banned substances. The companies, Mekong Delta Food Factory, South Vina, FOODTECH JSC and Khang Thong JSC Seafood Processing Factory, failed to pass food safety checks to enter the EU, according to the Rapid Alert System for Food and Feed (RASFF). Created by the EU in 1979, RASFF offers a round-the-clock service to provide notification of food safety risks before they reach European consumers. On April 25, the National Agro-Forestry-Fisheries Quality Assurance Department (NAFIQAD) under Vietnam’s Ministry of Agriculture and Rural Development announced the names of the four exporters, giving details as to why they had received the warnings from the EU. The frozen pangasius shipment of Mekong Delta Food Factory to Germany was subject to border rejection as it stank of ammonia and contained banned sodium carbonates, according to NAFIQAD. In the meantime, South Vina also had its frozen pangasius fillets barred from entering Spain, as the product contained the banned sodium erythorbate. Food authorities in Germany also detained a batch of canned tuna shipped by FOODTECH JSC because it was stained with histamine, which can be toxic to consumers. The Khang Thong JSC Seafood Processing Factory had its exports of frozen swordfish rejected as they were found to contain mercury. The NAFIQAD has asked the four companies to review its production process and materials to determine the causes of the food safety issues, as well as avoiding repeat violations. Vietnamese seafood exports have previously received warnings over the use of antibiotics and banned chemicals in the US, Japan and Saudi Arabia, according to The Saigon Times Online. “In the first quarter of this year, 31 export batches of Vietnamese shrimp and pangasius received food safety alerts for the same reasons,” the economic newswire quoted NAFIQAD head Nguyen Nhu Tiep as saying. Viettel Global, a subsidiary of the military-run telecommunication group Viettel, aims to develop one or two new markets and attract 8.35 million new customers in 2016, raising its total subscribers in foreign markets to 25 million. The targets were set at a recent Viettel Global Investment Joint Stock Company shareholders’ meeting. This year, the company hopes for total revenue of nearly 1.5 billion USD in eight markets (excluding Peru and Vietnam), representing a growth of 12.4 percent and combined pre-tax profits of 51.4 million USD, equivalent to 90 percent of the 2015 figure. It will also invest in building infrastructure in Myanmar, where it will take part in a joint venture with two local companies to deliver telecom services. Viettel now operates in Vietnam and other nine countries in Asia, Africa and South America with 85 million clients. It earned 1.4 billion USD in revenue in foreign markets in 2015. In Tanzania, its brand Halotel attracted 1 million users in only three months of operation. Malaysian real estate developer Berjaya’s Hanoi Garden City does not seem to attract home-buyers. As of now, the project’s infrastructure is finished. The high rise apartment complex is basically finished as well, but only a few apartments are being used. It is the same with low rise villas that standing mostly empty. Compared to Gamuda City in Hoang Mai district of Hanoi, also developed by a Malaysian developer—Gamuda Land of Gamuda Berhad, business seems sluggish at Hanoi Garden City. Gamuda Land launched the sale of its units in 2011 and 2015 to take advantage of the buying waves in the market. It also offered promotions for buyers after sale. Meanwhile, Berjaya does not seem to be doing anything to boost sales at Hanoi Garden City. Vietnamese developers’ nearby projects in Long Bien district also look a lot more exciting. At Vinhomes Riverside and Ecopark, one can see residents buzzing left and right. Hanoi Garden City, meanwhile, looks abandoned. The shops are lying deserted against one another and the 11-floor apartment complex is surrounded by a concrete wall. Moreover, the project is located in the northeast of the city, along Hanoi-Haiphong expressway, and far removed from anything else, making very few people want to move there. 32-hectare Hanoi Garden City was developed by Berjaya–Handico12 (BH12) Ltd., an 80:20 joint venture between Berjaya Leisure Ltd.—a subsidiary of Berjaya Land Berhad—and Hanoi Housing Development and Investment Corporation 12 (Handico 12). Hanoi Garden City’s construction started in 2009. It has an after-construction value of $500 million. The project includes the Garden Villas, with an area between 144 and 270 square metres for each land plot and three floors for each villa, and the 11-floor Canal Park apartment complex with an area of 5,777sq.m, a building density of 40 per cent, and each apartment having between 86 and 227sq.m. Berjaya joined in the development of many big projects in Vietnam, including Sheraton Hanoi Hotel, InterContinental Hanoi Westlake, Long Beach Resort in Phu Quoc island, and Bien Hoa City Square in the southern province of Dong Nai. The General Statistics Office has announced that the industrial production index (IIP) was estimated to increase by 7.9% over the same period last year in April, making a 7.3% year-on-year increase over the past four months. Of which, industries of processing and manufacturing; electricity manufacturing and distribution; and water supply and wastewater and waste treatment contributed 12.5%, 11.5% and 8.5% respectively in April while the mineral extraction industry fell by 8.1%. The IIP growth over the past four months, which was lower than that of the same period last year (9.6%), was thanks to 9.6%, 12.1% and 9% increases in the processing and manufacturing; electricity manufacturing and distribution; and water supply and wastewater and garbage treatment industries. A 1.7% decrease of the mineral extraction industry resulted in a 0.4% decline for industrial growth. Regarding the scale of industrial production over one third of the year, Thai Nguyen, Quang Nam and Can Tho topped the list with 42.7%, 32.8% and 24% respectively, followed by Hai Phong (14.6%), Bac Ninh (14.5%), Da Nang (10.5%), Hai Duong (9.1%), Hanoi (8.8%), Dong Nai (8.3%), Binh Duong (7.3%), Ho Chi Minh City (6.2%), Ba Ria – Vung Tau (5%) and Vinh Phuc (4.6%). The inventory index of the manufacturing and processing industry as of April 1 increased by 8.9% over the same period last year and the average index over the first quarter of the year was 74.4%. 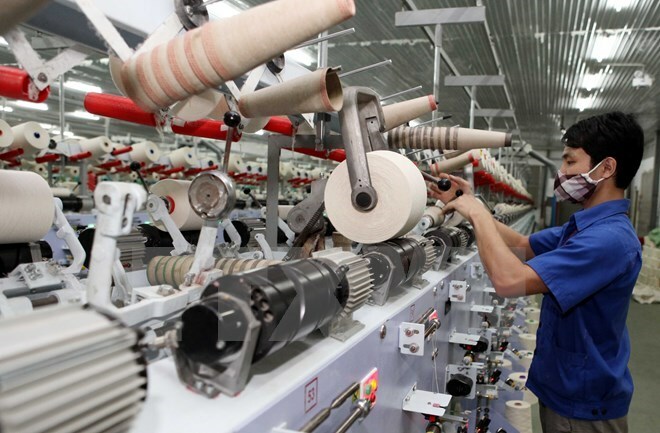 The GSO also said that the employment rate of industrial entrepreneurs as of April 1 had climbed by 6% year on year, in which the rate in State owned entrepreneurs increased by 0.6%, followed by non-State owned businesses (4.3%) and businesses with foreign direct investment (8.5%). Vietnam Airlines’ flights to and from Frankfurt have not been affected by a strike staged by the public service workers’ union in Germany which stalled operation in many airports, according to Chief of Vietnam Airlines in Germany Ngo Tri Hung. However, the Vietnam Airlines official recommended that transit-passengers through Frankfurt should check thoroughly if any other carriers might be affected by the strike. As the strike has spread to six airports - Munchen, Frankfurt, Düsseldorf, Cologne/Bonn, Dortmund and Hannover, the Frankfurt-based Lufthansa airline had to cancel nearly 900 flights on April 27, affecting around 87,000 passengers. Munchen airport was hardest hit, with only 90 flights operated during the day while 545 flights were cancelled.